This figure is from a BBC news story on the new European comission framework 7 research programme. 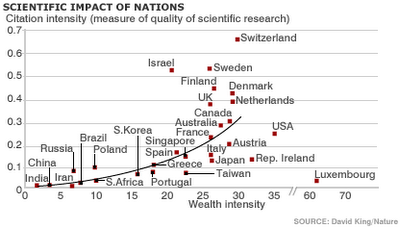 It shows how the wealth intensity of various nations compares to its scientific impact (as measured by citations). There are a couple of nations I was surprised by (through my ignorance more than anything else): the overwhelming advantage that Switzerland has, and the relative modesty of the US's citation intensity for starters. The SOAR cognitive architecture uses exclusively symbolic representation and processing. A recent addition to the basic working memory/procedural memory components of the SOAR architecture is an episodic memory component. An essential part of the functioning of this is the retrieval of the most relevant episode. This is a non-trivial problem due to the number of irrelevances in the episode. Biasing potential matches is thus a potential solution: this paper covers the possibility of using activation as a biasing factor. Working memory in SOAR is made up of a collection of attribute-value pairs, such as the current state (including external sensory information and internal inferences). If the contents of working memory matches the condition of any production rule in procedural memory (of the form condition->action), then that rule fires (or is executed) - even if multiple rules are activated. Each rule has the capability of modifying the contents of working memory, resulting in a possible action, or the firing of another rule. The characteristics of the SOAR architecture which are relevant to this particular study are as follows: (1) simultaneous rule firing (in the case where the contents of working memory match the conditions of multiple productions); (2) operators (in the case where multiple rules fire, they each propose an operator. Only one of these operators can be selected for application to the contents of working memory); (3) the decision cycle (propose, select and apply); (4) persistent working memory (two types: o-supported indicating that the contents of working memory remain intact until explicitly modified or cleared, and i-supported which are cleared from working memory when the rule which instantiated the particular element ceases to fire, i.e. match working memory). The original study to employ activation levels in the SOAR architecture was Chong (2003). This study proposed that part of the contents of working memory were subject to the effect of activation levels, where an item in working memory with a low activation would eventually be removed, even if it was an o-supported working memory element. The current paper under review changed this to apply to the entire contents of working memory (apart from i-supported, which is automatically removed anyway), although they kept the underlying principle of activation alteration: the more an element is used, the higher its activation level, and vice versa for litle used elements (ln decay used). The activation assigned to a newly created production is based upon the activations of those elements which contribute to its creation - this is a different approach to those methods which automatically assign newly created rules a relatively high initial activation level. One final general point on activation levels are that each reference to an element in working memory has its own activation level, with the overall element activation being a sum of each reference. Thus, each reference to an element can decay independently. For further details please refer to the paper. This updated version of SOAR is then tested in a 16x16 gridworld, in which the SOAR architecture controls the movements of an agent (or 'eater'), in order to examine the role activation has in aiding learning, specifically in retrieving past episodic experiences, as mentioned previously. In this case, retrieved past experiences were used as a comparison to the action the agent was currently considering, thus illustrating the importance of selecting the 'correct' past experience. When activation was enabled, the eater showed an approximate 30% improvement in performance over an agent which did not use activation to select an episode. Because of the fact that i-supported working memory elements do not have an activation level, this leads to the possibility of i-support masking, which occurs when the o-supported elements supporting an i-element are removed, thus removing the i-element, even though the i-element may have been referenced (refer to figure 5). To rectify this problem, a 'pay it backward' system was implemented, whereby activation levels of supporting o-elements may be increased if a dependant i-element is referenced. At this stage also, the 'pay it forward' scheme of basing the activation level of newly created productions on the activations of those productions from which it was created was also introduced. The overall results of experimentation (still using the eater simulation scheme) were clear. The pay-it-backward addition improved performance over the activation alone, and the addition of the pay-it-forward scheme showed still further improvement. I found this paper at just the right time in terms of my research. When looking at navigation tasks for robots, and when trying to derive inspiration and lessons from natural systems, one cannot get far without coming across place cells. Place cells are neurons located in the hippocampus (although there are possibly also cells in other brain regions with somewhat similar behaviours? ), and are so named because they can be observed to fire when the animal under observation is in a specific location is its environment. This observation is very robust in rats in particular (although other species have been used), and has led to the now pervasive view that place cells form the basis of a cognitive map - i.e. a map of the environment upon which cognitive operations may be performed (such as planning for e.g.). These maps may essentially be seen as allocentric 2-D coordinate representations of the environment - a property which every computational model of place cell functionality has inherited. It is interesting to note however that while this has been become generally accepted theory in the animal sciences, neurospychologists who study memory in primates and humans have been very slow to take on the theory. This is mainly due to the contention of the former that the hippocampus is dedicated to spatial memory in rodents (the aforementioned cognitive map), whereas in humans, the global memory deficits shown by hippocampal lesions in humans is well known, casting doubt on the solely spatial memory proposition. The aim of the paper is to review the evidence and put forward a theory of place cell function which is consistent with both camps. The classic literature on place cells in rats is first reviewed (mainly work by O'Keefe at al). Single neuron (extracellular) recordings are the most common means of measuring place cell activity. As mentioned, it has been well documented that these fire when the rat is in specific locations in the environment. However, as was noted in the initial experiments concerning the existence of these cells, but which has in subsequent studies been largely ignored, place cells also fire for non-spatial cues, which clearly isn't consistent with the cognitive map theory of place cell functionality. Additionally, subsequent studies looking for further evidence in support of the cognitive map theory, namely homogeneity and continuityof spatial representations and the binding of spatial representations in a cohesive framework, found evidence against cognitive maps. First off, evidence points to the fact that place-fields of plac cells do not provide a continuous map: clustering of place fields occur, indicating the over-representation of some spatial areas with respect to others. Secondly, it appears as though place cells involve a collection of independant representations, each encoding the spatial relations between some subset of cues. These three points against the cognitive map theory, along with some others, indicate the need for a rethink on this subject. The authors duly oblige with an alternative account: instead of a cognitive map solely tied to spatial stimuli, there exists a memory space: individual hippocampal cells encode regularitie present in the animals every experience, including spatial and non-spatial cues and behavioural actions. On a side note, this appears to me to be consistent with the idea of "fast" or "one-shot" learning in the hippocampus, and "slow" learning in the neocortex. It also seems to be not inconsistent with Fusters overlapping cortical hierarchies and distributed neural representations theory, upon which I have written in previous posts. According to this theory, different specialities of neuons arise in the hippocampus as a direct result of the different possible combinations of inputs and input weights, and the history of coactive inputs (essentially hebbian learning, I believe...), and where these inputs are derived from (from which part of the cortex, or brain). This new theory thus leads to an alternative explanation as to the activity of place cells: instead of being a cognitive map as described previously, they may be characterised as a set of activations along a temporal sequence as the rat moves in different trial episodes. This would also apply to the learning and performance of other non-spatial tasks, which would thus account for place cell activity for non-spatial cues. Given this account, the hippocampus is thus perceived to be central to the functioning of episodic memory. The paper concludes with the observation that this model can be distinguished from spatial mapping theories in that it proposes a set of mechanisms which account for both spatial and non-spatial memory dependant on the hippocampus. From the point of view of the first to sentences of this post, and my observation on this models relation to Fusters cortical hierarchies, it seems possible (or not-impossible as I'd prefer to say) that navigation can be described in terms of associative links, instead of having to rely on an internally generated cognitive map. What is a theory? (p13) "Let there be some body of explicit knowledge, from which answers can be obtained to questions by enquiries. Some answers might be predictions, some might be explanations, some might be prescriptions of control. If this body of knowledge yields answers to those questions for you, you can call it a theory." "There is little sense in worrying that one body of knowledge is 'just a collection of facts' (such as a database of peoples heights and ages) and another is 'the fundamental axioms of a subject matter' (such as Newton's three laws plus supporting explication). The difference is important, but it is clear that they answer different sorts of questions, have different scope, and have different potential for further development: i.e. different bodies of knowledge." Theories are to be nurtured and changed and built up. One aught to be happy to change them in order to make them more useful: almost nay body of knowledge can enter into a theory if it works. An especially powerful form of theory is one which describes a body of underlying mechanisms, whose interactions and compositions provide the answers to all the questions we have. The word 'cognition' emerged in part to indicate the central processes that were ignored by peripheral perception and motor behaviour. Yet one problem with cognitive psychology has been its persistance in thinking about cognition without bringing in perceptual and motor processes. Language should be approached with caution and circumspection. A unified theory of cognition must deal with it, but I [Newell] will take it as something to be approached later rather than sooner. [This being a view I personally agree with - perception and movement evolved before language, so I take that to be an indication what I will call, perhaps unjustly, more fundamental processes, and thus of more interest - to me anyway :-)]. We cannot face the entire list [...of human cognitive capabilities...] all at once, so let us consider it to be a priority list, and work our way down from the top. What I mean by a unified theory of cognition is a cognitive theory that gets significantly further down the list than we have ever done before. According to Newell, the constraints that shaped the human mind are (in the order he listed them): (1) Behave flexibly as a function of the environment; (2) Exhibit adaptive (rational, goal oriented) behaviour; (3) Operate in real time; (4) Operate in a rich, complex, detailed environment, capable of perceiving an immense amount of changing detail, using vast amounts of knowledge, and controlling a motor system of many degrees of freedom; (5) Use symbols and abstractions (known from introspection); (6) Use language, both natural and artificial; (7) Learn from the environment and from experience; (8) Acquire capabilities through development; (9) Operate autonomously, but within a social community; (10) Be self-aware and have a sense of self (meta-cognition? ); (11) Be realiseable as a neural system; (12) Be constructable by an embryological growth process; (13) Arise through evolution. Concerning point 5, I believe that one must be very careful when using introspection when determining constraints of the human mind. For example, introspection tells us that thouhgts occur serially, however, it is well known that the brain is a massively parallel system. This seemingly fundamental difference is explainable by theories of consciousness (e.g. Baars's Global Workspace Theory), but serves as an example of why introspection should be used with caution. Continuing with the notes... There is a production system called Grapes (Sauers and Farrell, 1982) that embodies the basic production action and automatic creation mechanisms. Finally, there is a book on "Induction" (Holland, Holyoak, Nisbett and Thagard, 1987), is an interdisciplinary effort using different system vehicles: Hollands Classifier Systems and the more classical problem solving systems. Just as I am slowly drifting off to the land of nod, I came across this post by Deric Bownds (MindBlog). As I'm tired, and since it concisely says what needs to be said, there's a copy below. Apologies. I'm wondering how long it is going to be before we start seeings advertisements for "effortless memory enhancement" devices inspired by the work of Marshall et al reported in Nature. (For example, a tiara that places button electrodes bilaterally over the mastoids and frontolateral cortex and generates a low oscillating current around 0.75 cycles per second during non-REM sleep). Although I'm tempted to cook down their description to make it a bit more palatable, their abstract does do the job:"There is compelling evidence that sleep contributes to the long-term consolidation of new memories. This function of sleep has been linked to slow per se is unclear, but can easily be investigated by inducing the extracellular oscillating potential fields of interest. Here we show that inducing slow oscillation-like potential fields by transcranial application of oscillating potentials (0.75 Hz) during early nocturnal non-rapid-eye-movement sleep, that is, a period of emerging slow wave sleep, enhances the retention of hippocampus-dependent declarative memories in healthy humans. The slowly oscillating potential stimulation induced an immediate increase in slow wave sleep, endogenous cortical slow oscillations and slow spindle activity in the frontal cortex. Brain stimulation with oscillations at 5 Hz—another frequency band that normally predominates during rapid-eye-movement sleep—decreased slow oscillations and left declarative memory unchanged. Our findings indicate that endogenous slow potential oscillations have a causal role in the sleep-associated consolidation of memory, and that this role is enhanced by field effects in cortical extracellular space." In this paper on network memory, Prof. Fuster presents the view that memories are held in the brain not in localised regions, but in distributed networks that span the entire neocortex. There is however some organisation to this: the overlapping cortical hierarchies I mentioned in a previous post. "It is reasonable to assume, as Hayek did, that memory and perception share, to a large extent, the same cortical networks, neurons and connections." Thus, new memories or perceptions are expansions of previously existing ones - additional associations to pre-existing networks. Due to this, any individual neuron, or small group of neurons, may be part of numerous networks and thus memories.If I may make use of another quote which I think is one with important implications (even if it is somewhat fuzzy from certain points of view): "Memory networks are most likely to develop, at least partly, by self-organisation, from the bottom up, that is, from sensory or motor cortical areas towards areas of association. They also probably develop in part from the top down, guided by attention and prior memory stored in the association cortex; here the synchronous convergence would be between new inputs and inputs from old reactivated networks. In any case, networks grow on a substrate made of lateral as well as feedforward and feedback connections." The result of this type of organisation would be hierarchical memories, which is emergent from the interactions of multiple memory units. However, this self organisation does not start from scratch with a newborn: phyletic memory (or memory of the species - that which we are born with) is postulated to determine what the structure of the sensory and motor cortices is at birth - in other words, they already contain the necessary information to begin interacting with the environment from information which is genetically defined. Neural plasticity of these regions (possible remaining to adulthood) allows these memories to be refined before becoming relatively fixed for life. This phyletic memory thus serves as the foundation upon which personal memories may 'grow' - fusing so that there is no way to distinguish between the two. Perceptual memory is memory acquired through the senses. A hierarchy exists, from "sensorially concrete" (memories of elemental sensations of all modalities) at the bottom of the hierarchy, to "conceptually general" (abstract concepts which ,although originally acquired by sensory experience, has become separable for cognitive operations) at the top. As one rises in the hierarchy, so do the networks representing memories at each level become more distributed and widespread in the cortex. Perceptual memory with this organisation does not however persist independently of motor memory (described below) - there are numerous reciprocal connections and associations between the two hierarchies, which naturally has important implications for sensory-motor integration and working memory. Motor memory is the representation of motor acts and behaviours, including much, if not all, what has been traditionally defined as procedural memory. Much of the motor memory in the lower levels of the hierarchy is essentially phyletic (i.e. the fulfillment of basic drives, such as defensive reactions), however is conditionable and subject to control from 'higher' levels. The prefrontal cortex is the highest level of the motor hierarchy, which indicates a role not only in the representation of complex actions, but also the operations for their enactment, including working memory. The next part of the paper is concerned with the dynamics of memory. At any given time, most long-term memory is out of consciousness, presumably equating to the relevant neural networks being relatively inactive. Reactivation occurs through associative processes of recall or recognition, which may be due to either internal or external stimuli. The hippocampus is implicated strongly in this reactivation process. Network dynamics can best be observed using electrical stimulation or neuroimaging. Using the monkey task described in my other post on Fusters cortical hierarchies, the reactivation of networks can be observed in both posterior regions (sensory recognition/recall), and frontal regions (maintenance/planning/action). Please watch the short video clips showing this spread of activation (links from this post)- they really are enlightening. By this view, working memory is active memory, and is thus distinguished by the state of the network, and not the cortical location of activations (although this is dependant on the two distinct cortical hierarchies just reviewed - thereby adding adding a location requirement on working memory). In the concluding comments, Fuster notes that even though a hierarchical structure is in place, this does not mean that they are rigid and stored in separate cortical domains. Instead, different types of memories are made up of numerous 'elements' distributed across the different levels of the hierarchy (or both hierarchies as the case may be). The final note that the paper makes is concerning working memory and its relationship to long-term memory. From this hierarchy setup, the two are one and the same, although as I noted in the previous paragraph, merely saying that working memory is 'activated' long-term memory isn't sufficient - from my understanding of how working memory would fit within this hierarchical network theory, working memory would be made up of those activated networks across both the perceptual and motor hierarchies (and at multiple levels within those hierarchies) such that some form of coordination (planning?) is required between the two 'types' of memory. In other words, executing a motor action or recognising an object in the visual field in themselves do not require working memory (even though by this theory they would result in activated cortical networks), but identifying an object to be manipulated in some way would require working memory (coordination between the activated networks across both sensory and motor hierarchies). Thoughts and notes on the Jumping spider - implications for the development of "cognitive robotics"? Engages in planning, and other 'intelligent' behaviour which seems inexplicable given that the brain of the spider is the size of a pinhead, i.e.very small. They do however have independantly moving eyes (what is the structure of these? ), each of which on its own is larger in size than its brain. Does the eye in itself provide an additional means of 'processing' information for the brain to enable more complex behaviour? Does the spider, through development from egg to adult, exhibit developmental learning (learning from experience), and does behaviour appear to be 'hard-wired' as with other insects (cognitive development occurs accross multiple generations rather than with a single generation)? These notes taken largely from Alan Newell's observations as described in his William James Lectures (and the subsequent book, "Unified Theories of Cognition", 1990). Chunking has a long history in psychology - the classic study into the capacity of short-term memory by Miller (1956) introduced the term in the most commonly used context. It is a unit of memory organisation, formed by bringing together a set of already formed chunks to form a larger unit. It implies the ability to build up structures recursively, thus leading to the hierarchical organisation of memory, and it appears to be a ubiquitous feature of human memory (sits reasonably well with Joaquin Fuster's view of memory being based upon associations at all levels). Using the example of the effect of practice on task completion time, this memory organisation sets out three general propositions. Firstly, chunking occurs constantly and at a (fairly?) constant rate. More experience results in more chunking. Secondly, peformance of a task is faster if there are more relevant chunks to the said task. This last point presents a direct conflict with the processing in current digital computers: the more rules there are, the more computational overhead, thus the slower the processing. Thirdly, the presence of the hierarchical structure predicts that higher level chunks will apply to fewer situations than lower level chunks. The higher the chunk in the hierarchy, the more sub-patterns it has, thus the less likely is it to match the current situation exactly. These initial observations in general, and this application as an example, provides the theoretical basis of the SOAR cognitive architecture. Thus, the observation of human behaviour leads to general behavioural traits, which may (or may not) be considered as "laws of operation". Modelling these most general "laws" may thus provide further insight into human functional operation. The country's future, he says, lies "through science and technology helping us - not just to gain more benefits in terms of material possessions and consumer goods which obviously are very important to people"..."But also things like the environment. We won't solve climate change without the best scientific minds"..."We're not going to be able to treat people for diseases unless we have the best scientific minds." Apparently, science funding has increased hugely over the past few years (which I'm not disputing). I just hope this means that I can get funding! Scientific Reporting/Journalism in the UK?